I am not the world’s most frugal clothes shopper, spending $750 to $1225 per year on my wardrobe for each of the past 10 years. So with over $10,000 spent in 10 years, I must have a stunning wardrobe, right? I wish! For every piece that was just right, I probably have two shapeless, stretched, twisted, shrunk, faded and worn-out items. I am a reasonably educated shopper and I know what quality looks like. So why do I keep allowing myself to make exceptions? My last post was about how hard it is to buy new Canadian clothes. I did some online research about where clothes are made and what various brands have to say about their production choices. It seems they can all “talk the talk,” but it was hard to know what to believe. 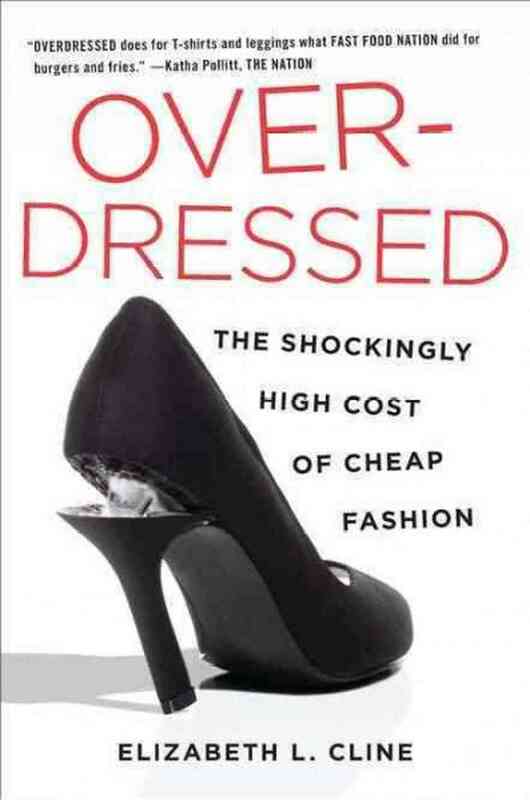 The book explained the fashion production system very clearly, and how it has changed over the years. Chapter 2 tells us how it is done these days. A designer pitches an item to a brand or a retailer; or an in-house designer comes up with an item. They can easily rip off another designer because copyrights on design are very lax. The company sends drawings, specifications and their target cost to a production “middle man” who shops it around to various factories, getting bids on the best price. The factories offer to “source” the item, shopping among its vendors for the lowest priced fabrics, fasteners and trims. The agent informs the retailer or brand what they will have to do without to come in at their target price: fabric quality, the exact colour wanted, and so on. Then the schedule has to work: sometimes the factories are booked up a year ahead. However, the producers will often accept jobs, and then subcontract them to a cheaper factory in another country. (Your Made in China top may find you via Viet Nam). Essentially, the whole production process is a sustained effort at keeping costs down and profits maxed. You probably know that manufacturers have to meet local labour laws and local minimum wages. 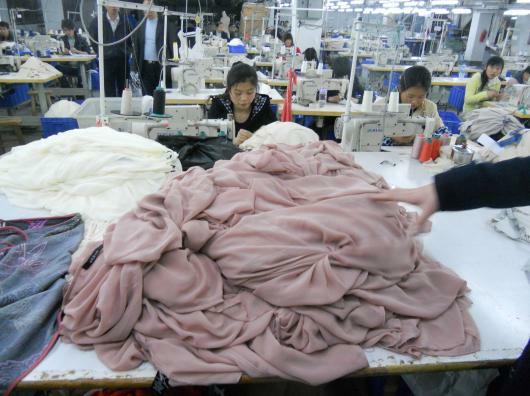 Most brand names only design and distribute clothes; they don’t own the factories or employ the workers. Somehow I always thought that, say, American Eagle would have a factory in Malaysia where all its goods were made, and they would be more-or-less the “employer.” But no, almost all brands choose the cheapest and fastest among thousands of factories worldwide bidding for each production run. My favourite chapter was the one about thrift shops and what happens after you donate your old clothes to them. I hope you’ll read it! The author’s strategy for dealing with clothes buying is exactly the same as what my costume-designer child, Link does: sew for yourself, buy the work of affordable local designers, buy vintage, buy used, modify and repair clothes, buy less, buy quality, don’t be a sheep, and have fun with accessories. My approach is to know what I don’t like: I don’t shop at teen stores, or look at business suits and dresses, or browse evening wear. 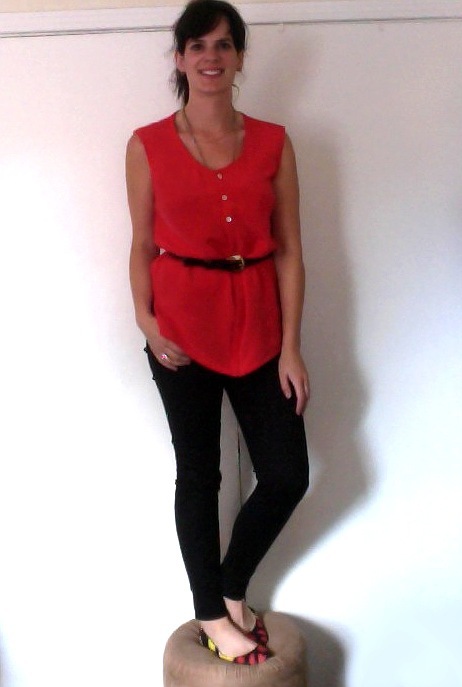 I try for smart casual at work and simple basics at home (jeans and T-shirts). 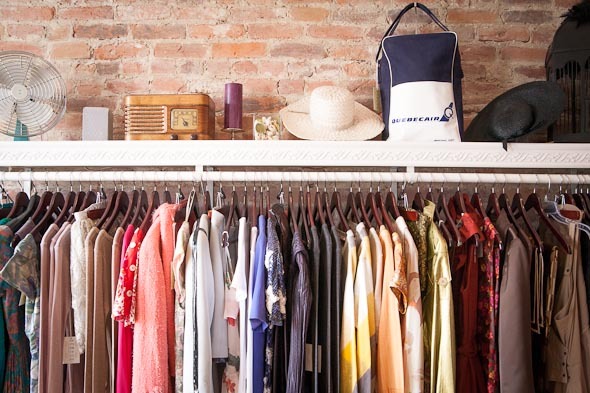 It helps me a lot that I just don’t shop much, going to clothing stores only when I specifically need something – quite often a replacement item. I am not big on accessories, but maybe someone could train me, LOL! I check what clothes are made of and how they should be washed. I obey. First, be kind and do not donate clothing that is worn out, torn, stained, missing buttons, or has a broken zipper. A real person has to sort it, and it will not be sold. Unfortunately, there is no enterprising poor person out there waiting to scoop it up and bring it back to life. (Well, maybe if it’s Chanel). Then, at the very least, ensure that everyone in your household knows how to promptly remove stains from clothes and sew a button! Great advice – but is there scope for ‘rag bags’ and how do you donate to those? I do know how to sew a button, or a milk crate cover 😉 I actually need to resew labels on my coats that have torn off and can’t hand from them anymore. Kudos to Link for her philosophy on clothing – I’m more like you, I want it to be easy, and quick, and not too pricey cause I’m never 100% sure I’ll love it. Like I love my black velvet jacket to bits, but the navy one I recently spent around 80Euro on, I don’t love, but I didn’t know I wouldn’t love it at the time, and forked out what I thought it may have been worth to me… hard to explain, but I was let down! I used to know some charity shops that would specifically ask for any kind of fabric to recycle, so I imagine it would be best to just ask them! I also know some flea markets that will take bags of old T-shirts for rags. As you know, I recently gave away a big stack of old towels and blankets to a pet shelter. I know just what you mean about paying what you think something might be worth. I have misjudged so many times, how much I thought I would love some piece of clothing. And it’s often about fit – what I thought was good enough, isn’t. I dearly wish I could sew but not yet! There was a scandal here in Australia a few years ago about our iconic “Aussie” brand of footballs. The Australian manufacturer “thought” they were paying for fair wages and conditions to their sub-contractors in Asia. It transpired that these factories were sub-contracting to home outworkers, many of whom were children who did the stitching. I was *horrified* that my child was playing with a ball that had potentially been made by a child his own age, working 8+ hours a day stitching balls. Since then, I’ve found it really hard to buy the $5 tee-shirts at Kmart…they can’t possibly be paying fair wages. The problem is that it’s still really hard to find alternatives that you *know* are ethically produced. Yes, it’s to the point where you’d actually have to research each label name to see what their practices are. Or maybe make a list of “the good guys” and buy only from them! I have been meaning to find this book as the Library doesn’t carry it. I am shocked when faced with the reality of how “non-normal” a shopper I am. My expenditures thus far this year on clothing totals a whopping $27, and i don’t anticipate needing anything more this year. That covers a pair of sandals, 5 pairs of pants, 5 tops, 2 under tanks, and two packages of brand-new underwear. I wouldn’t have spent that much but I messed up and ended up with paint on clothes I hadn’t intended to wear while painting. To spend more than $1,000 a year on clothes blows me away. It’s funny – I rarely even feel that I am buying new clothes or changing my look. Except for some vacation clothes I bought in May, I mostly replace things that have worn out, buy a $75 pair of shoes for work that will last me a couple of years, and so on. $1000 to $1200 is what I pay just to maintain the look I already have! Back in 1984 I paid $65 for a pair of hiking boots by a well known company because feared falling on ice carrying my newborn. When I lost my home in the fire in 2001 I still had them, best $65 I ever spent. They were made by Coleman, I was curious and did a search similar ones are $227 a pair. The number of winters I used those boots made the investment so worth it. I’m trying to be a fairly conscious shopper when it comes to any new purchases. Over on Save Spend Splurge MoochiMac wrote a lot about clothes from China and it really opened my eyes – some of it is frightening! I often wonder about how much money I could have saved if I hadn’t bought all those clothes I have not worn more than once. Thankfully, that’s in the past. As I grow older, I have become shopping weary. And, like you, I don’t shop unless I specifically need something. I have always admired people like Link who are creative and talented and socially conscious. I do like sewing, like craft and other needlework; to restore, even make, my own clothes is something I long to do but never got down to doing. I have learned so much from your informative post: I had not realised the tortuous process and amount of middle man wrangling involved in manufacturing our clothes. Thanks. I learned to sew many years ago and made a few simple items but it wasn’t something I really enjoyed. I am happy, though, that I can do hemming or minor alterations. My stepmother makes all her own clothes except for shoes and underwear and makes lovely good quality things. I’ve made a few clothes for myself but am not great at modifying patterns to fit me perfectly and have ended up with things I don’t want to wear because they don’t fit! Material seems to be really expensive too. My favourite thing I’ve made for myself is a summer dress that I made from an old sheet. It’s not something I could wear to work but I love wearing it to the beach. Good for you for giving clothes sewing a serious try! Funnily enough, it’s the sewing machine I don’t like. If it didn’t take so long, I enjoy sewing by hand! Thanks for the review, I’ve been wanting to read this one. 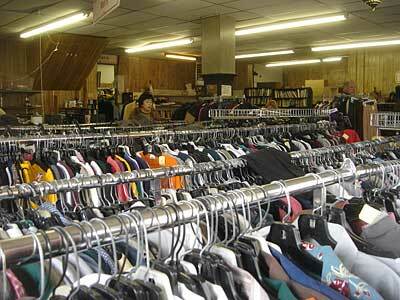 I love the idea of thrift store shopping, but in reality it doesn’t work out for me. It’s hard enough for me to find clothes in regular stores (being almost 6′ tall and female is still a pain when it comes to shopping), if I’m limited to thrift store stock it’s practically impossible. And so much of the stuff around here looks pretty darn worn. Plus, like you I no longer enjoy clothes shopping and having to check thrift store after thrift store just extends that process. I’m trying to make up for buying new by buying a lot less. Yep, me too. Although sometimes the number of purchases seems to creep up on me before I know it…although I like to think they’re all good-quality necessities! This is the second review for this book I’ve read – it looks really interesting. I love the challenge of shopping in thrift stores, but sometimes have to settle for buying new – especially for tops as I have a really long body. And when I buy stuff new I generally can’t afford to pay too much, so I end up buying cheap (but not the absolute cheapest). It is so hard to balance cost, quality, local buying and environmental impact – unless you simply do without. I find it exhausting sometimes!